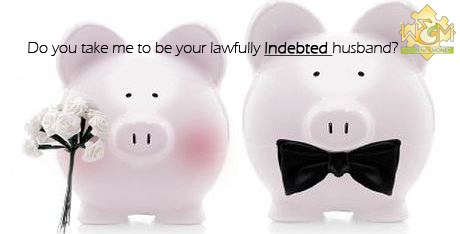 Debt and Marriage – Lawfully Indebted Husband? Would you turn down a marriage proposal if you found out your husband-to-be was heavily in debt? If you say yes, then money is more important to you than love, right? If you say no, then love is more important than money, right? If you substitute the word money for debt would this change your answer? Although there are no right or wrong answers to these questions they raise the issue of marriage and how debt may affect relationships. The answer, of course, is a definitive yes. Debt will affect your marriage just as spenders and savers are destined to clash and burn. How we manage our money digs deep into our personalities and attitudes towards life. I would say the biggest problem with relationships is falling in love before you find out about the nasty financial details. In many cases it’s too late. The blood is no longer in the cognitive centre. The western culture still worships romance. Beneath the challenges of life the belief that love can conquer all continues to flourish – only, on the big screen or in the passion of heart- throbbing novels you won’t hear about debt or debt problems. Love is not sitting in a banker’s chair, a bill collector’s embrace or a bankruptcy trustee’s order to seize family assets. Another problem the western culture promotes as well as tolerates, is the avoidance of debt or even being 100% honest with people about our finances. We over-inflate our incomes and exaggerate the value of our assets. We sidestep questions about credit obligations. We would be offended if anyone should ask for any details. It is, furthermore, socially acceptable to tell only bits and pieces about our finances. Even spouses in long term marriages do not tell everything to their wives and husbands. Some have separate bank accounts and credit cards. So, my question is this. When do we tell the truth about money and debt? Oh, that reminds me how corporations and government use elaborate accounting strategies to hide nasty little secrets or conceal embarrassing failures. Perhaps they set the stage for the rest of us to follow. We disclose our financial stuff on a need to know basis, which far too often means at a moment of crisis when something goes wrong – or when they get caught – in lies, misrepresentations and falsehoods. And just one more thing. Our culture in the new millennium has discarded almost all fear of debt. Many people are not overly worried about the various debts each other has while dating. There are many reasons for this. Secondly, many young people have student loan debts and are still in school. They have debts already but no employment – and they have fallen madly in love. The student loan debts while at school are not repayable yet. Not until 6 months after graduation. So, they have nothing to worry about now – just later. Thirdly, young people are just starting out. They have to have a car and other essentials and realize their incomes will eventually get better. So, they postpone any real serious thought about a realistic budget and savings plan because they are spending most of their incomes on housing and living costs – and of course creditor payments. They know it’s tough out there. Debt is okay. Debt is good. Credit is their salvation to income shortages and inflation. Fourthly, once in debt, it is really hard to get out. Interest charges stifle the prospect of debt freedom. We get trapped in a cycle of debt and creditor payments. The only way out for many is to remortgage their homes. Some end up in bankruptcy. Others live in debt all of their lives. So, it’s a very important question, debt and marriage. I recommend that not only do couples talk about their expenses and financial aspirations, but they set down budgets and compare their expenses. Learn all you can before marrying the wrong person. Money issues and debt problems are high on the list of causes for marital breakdown. This entry was posted in Blog, Women and Money. Bookmark the permalink. Both comments and trackbacks are currently closed. Entrepreneurs are in Personal Debt! Women Take Charge of the Finances and Reduce Stress!